Philippine House Designs boasts ready-made house designs that are climate-responsive. Climate-responsive means factors such as Philippine climate is taken into consideration to maximize wind and minimize the hot sun into the house. The image below shows a few of the design features we have applied in our climate-responsive designs that will help you cut costs in running the homes. 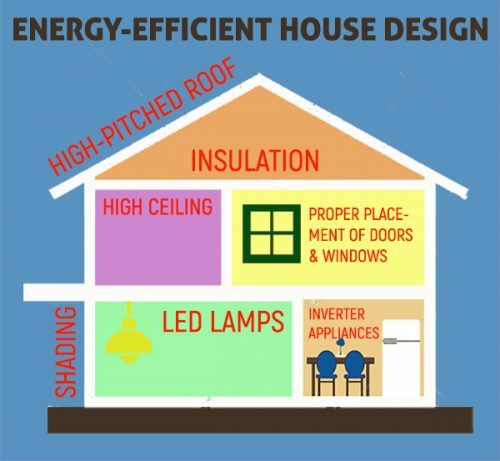 A well-designed house could give you big savings in electricity bills! Proper shading and proper placement of windows provide you with cooler homes, therefore there is less need to use air-conditioners and fans. Our ready-made climate-responsive house designs are available for as low as P10,000. We can also customize an energy-efficient house based on your design requirements and lot. Just message us for a free quotation!